Not long after the conquest, the City of Mexico's rise to become the crown jewel in the Spanish empire was compromised by the lakes that surrounded it. Their increasing propensity to overflow destroyed wealth and alarmed urban elites, who responded with what would become the most transformative and protracted drainage project in the early modern America—the Desagüe de Huehuetoca. Hundreds of technicians, thousands of indigenous workers, and millions of pesos were marshaled to realize a complex system of canals, tunnels, dams, floodgates, and reservoirs. 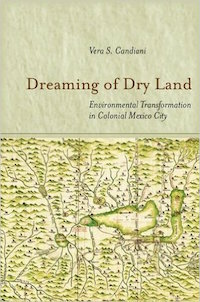 Vera S. Candiani's Dreaming of Dry Land weaves a narrative that describes what colonization was and looked like on the ground, and how it affected land, water, biota, humans, and the relationship among them, to explain the origins of our built and unbuilt landscapes. Connecting multiple historiographical traditions—history of science and technology, environmental history, social history, and Atlantic history—Candiani proposes that colonization was a class, not an ethnic or nation-based phenomenon, occurring simultaneously on both sides of an Atlantic, where state-building and empire-building were intertwined.